Return from Exile: Contemporary Southeastern Indian Art, curated by Tony A. Tiger, Bobby C. Martin, and Jace Weave at WCU Fine Art Museum is a national traveling exhibition is inspiring is an understatement. This is one of the first major exhibitions of contemporary artists from tribal nations, (Choctaw, Chickasaw, Cherokee, and Muscogee (or Creek), and Seminole tribes), all historically connected to the Southeastern United States. These tribes were all forcibly removed in the 1830s to what is now Oklahoma as a result of the Indian Removal Act of 1830. This exhibition is a moving representation of the return of these artists to their ancestral homelands. Pottery, basket weaving, printmaking, paintings and drawings and other media are al a part of the exhibit. 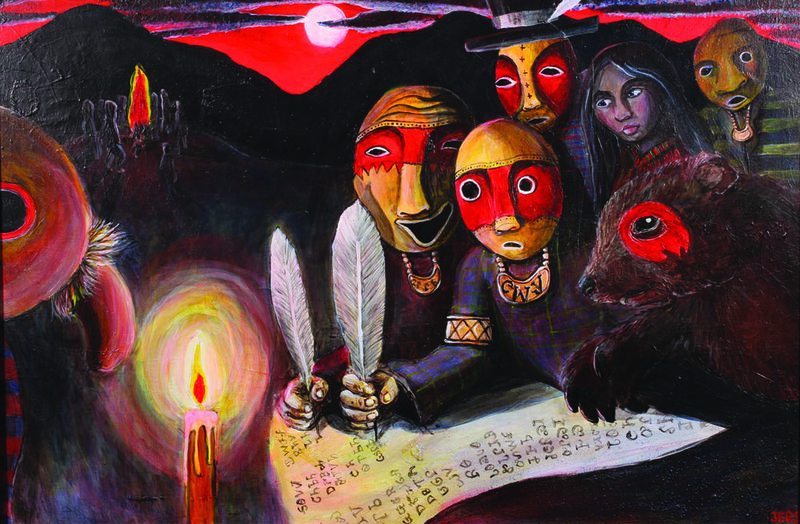 While the show is up until Dec 8th, the reception on November 10th coincides with an all day Native American Symposium at WCU and an evening of music from the Canadian band A Tribe Called Red. A Tribe Called Red.looks to the future, without losing sight of their past, showing that their wide range of musical influences ( modern hip-hop, traditional pow wow drums and vocals) all succeed to create a unique and powerful electronic musical experience. The band from Canada has performed at music festivals all over the world. The music layers experience and culture, positive indigenous identity and acceptance, social justice and inclusivity, ATCR shows how they are truly producers not consumers of their branded “Halluci Nation.” Worth Checking out !